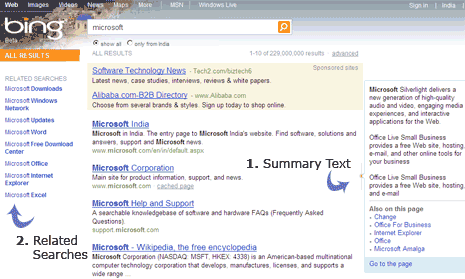 Microsoft has managed to create lot of hype for its newest attempt to capture search market with Bing Decision Search. It went Live a while back, if you are still planning to explore Bing, read on for quick, easy and more productive Bing Search drive. 1. Summary text – Don’t be in hurry to click through links on results page. Hover on the extreme right on links on result page and see a pop-up showing summary text of content on that specific link. 2. Related Searches – Bing helps you dig more for current keyword being searched for. Keep an eye on left sidebar for related search keywords, you might be looking for something listed there. 3. 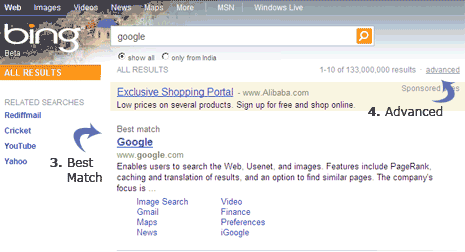 Best Match Feature – Similar to Im feeling lucky button on Google Homepage, Bing has best match feature. Search for google keyword on Bing, it will show the best match as www.google.com (of course!). 4. Advanced options – Click the advanced link and see lot of options to customize your search results. You can see search results for specific region, languages and web URL. 5. RSS Feed for search results – You can grab RSS feed URL for any keyword search results on Bing. Look for RSS icon on the left-bottom side while searching under text tab on Bing. 6. Save & share searches – Bing allows you to save specific keyword searches. You can even share saved searches with friends, login using Live account to get going. 7. 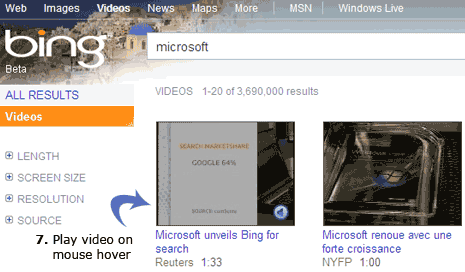 Play video results – You can mouse hover to play and preview video results for any keyword using Bing Video search. One cool way to preview videos quickly before you jump over to full video of your interest. 8. Xrank for Celebrity buzz – You can track online popularity of any celebrity from fashion, politics. Just go to Xrank and type name of any celebrity to see all the juicy details. 9. Maps are more neat – Bing maps feature is more neat and localized. You can easily search for important places on map without getting lost. Starter pointers on left sidebar are cool. 10. Image Search face or body – Bing neatly display different options while you search for celebrity or people images. Click people option on the left sidebar and checkout more juicy pics by choosing options like faces, head – shoulders and other. I love bing.Thank you very much your sharing this information.Great information.I gained some knowledge from your posting. Re#1 – If you come to the conclusion that these hover links are just a nuisance, and you use Firefox, a simple approach is available. You need two Firefox addons (a) Adblock Plus and (b) Element Finding Helper for Adblock Plus. Whilst these can be somewhat complex, basic installing and use is very simple. You’ll use the Element Finder to point at what you want blocked, then that’ll add it to Adblock Plus, and voila. The exact same method will block Google’s hover previews too, and many other things you might want to block. Go easy though, in case you block a site to death! Bing is coming along nicely. But I think I’ll be using Google a bit longer until they create as many search operators as Google has. How does bing’s “Save & share searches” work? I can find no mention of it anywhere? I am rather impressed by bing so far, lets see how it goes against the giant that is Google. I made some easy searches and it didn’t show up relevant results as good as Google. All i can say is Bing searches impressed me. I think it’s better than Google.